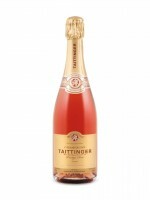 Taittinger’s stylish rose champagne offers the core of red berry fruit that defines pink bubbly, with marked fragrance and complexity befitting the pedigree of the region. The blend is Chardonnay dominant (with Pinot Noir and Meunier) and gains its rosy tint from the addition of 15 percent red wine (Pinot Noir). It’s seriously enjoyable, a splurge-worthy bottle for Mother’s Day celebrations or other note-worthy occasions.